In our pursuit to recognize today's best poets, we want to celebrate one outstanding piece of poetry, OPEN to all poets regardless of publication history, with a $5000 award and publication. 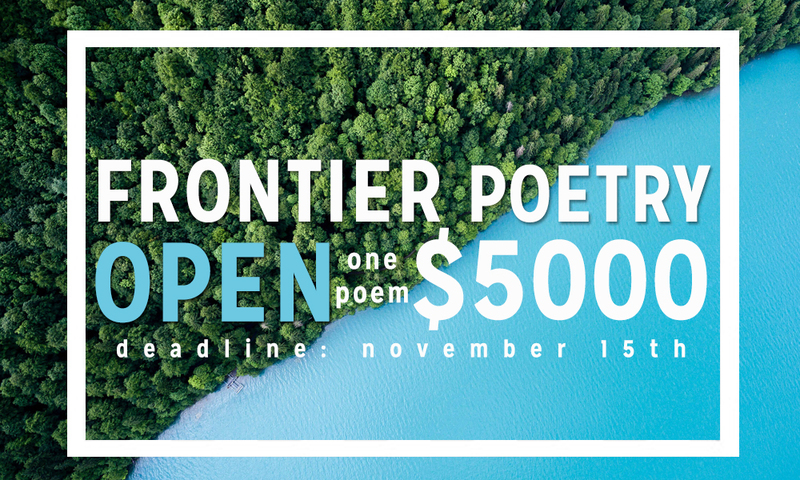 Ten finalists will also receive $100 each and all winners will earn publication with Frontier Poetry. The Frontier staff will select the winners and finalists. The winners and honorable mentions will be announced in February 2019. We look forward to offering this annual prize where emerging and established poets are considered in equal measure. Submissions are open to all poets: emerging and established. No identifying information in the submission document. No more than ONE poem per submission. There is no line-limit. Poems may be any length, any style, or any subject. Multiple submissions are allowed, but each new poem requires a new submission and fee.